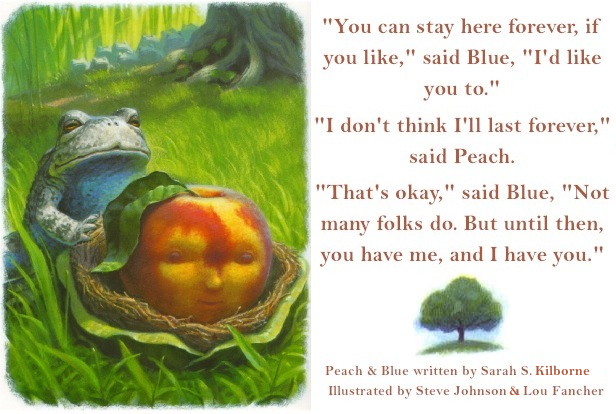 Peach & Blue by Sarah S. Kilborne (Leaving Vietnam: The Story of Tuan Ngo), illustrated by Lou Fancher and Steve Johnson (I Walk at Night, The King's Taster) is a gorgeous story about seeing the world in a new way. There are times when we meet someone special and introduce them to our world; a world that is common to us. But we begin to see it anew through that person's eyes because it is wonderful to them. This is a book about friendship and love, about helping and supporting another person's dreams, and about seeing the world around you with wonder and gratitude. Please find Peach & Blue at your local library or purchase your very own copy. This is one book that everyone should have in their home forever. Illustrated in full color. He is a blue-bellied toad hopping aimlessly through life. She is a sad peach yearning for escape and adventure. Then one remarkable day, Peach and Blue explore the pond that Blue calls home and awaken each other to a world neither has ever really seen before. Lush illustrations by the award-winning illustrating team of The Salamander Room and The Frog Prince, Continued perfectly complement this unique and graceful story. *Click here for a small article that tells a little bit about Sarah S. Kilborne. *Please also visit the website of illustrator team Lou Fancher and Steve Johnson. They've done over 30 children's books together! 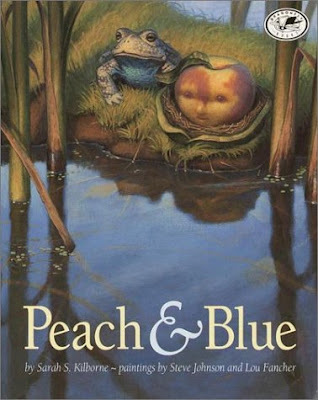 *Check out this great review of Peach & Blue. *And this is a curious article about Frog & Peach restaurants (it mentions this book at the end).